How often should you trim your trees? How much does it cost? Take a look at this guide to learn what you should consider about tree trimming services. We love them when they bloom, or when their leaves turn colors in early autumn. Yet, there comes a time when even the most majestic trees need a little trim. Sure, you could just hire anyone on the spot to take care of the process. However, incorrectly trimming a tree could severely damage it or even kill it. That’s why it pays to do your research. If you’re in need of tree trimming services, there are a few things to consider. Understanding where to look, who to talk to and which criteria to require can make all the difference in choosing a qualified team. Whether they’re on your personal or commercial property, you shouldn’t trust just anyone with your trees. Consult this comprehensive guide so you know what to expect before you sign on the dotted line. The ideal time of year to trim your trees depends on why you want them cut back, or pruned, in the first place. Are you just looking to lightly prune a few small, low-lying branches? Have you noticed some unsightly dead wood that you want to get rid of? If so, these are often tasks that you can handle on your own, at any time of year. Yet, if you’re looking to more substantially trim your trees, or if the branches you want to be removed are higher or larger than you can safely cut, you’ll want to call in a team of professionals. This can be done in either the winter or summer, depending on your long-term goals. Most traditional tree trimming activities take place in the late winter after the trees have gone dormant and the coldest part of the season is behind you. Trees cut back at this time experience rapid new growth once spring arrives. Thus, if you’re trying to encourage your trees to grow tall again, winter pruning is ideal. There are also a few more advantages to trimming at this time of year. For one, the wounds you create on the tree will heal quicker during the dormant season. You’ll also be less likely to run into any rodent or pest infestation inside the tree at this time. If you’re pruning a maple, walnut or birch tree, these will also have less sap during winter. This means once you cut them, though they may appear to “bleed,” the amount of flowing sap will be less. Keep in mind, however, that bleeding does not hurt the tree, though it might attract nearby pests. Another reason to trim in the winter? The team you hire won’t have to work around tons of foliage while they’re cutting, helping them to do a more accurate job. On the other hand, you might not want to encourage a tree to grow any more at all. In fact, you may be looking to shape a tree’s growth by slowing specific parts of it. Or, you might want to dwarf a tree to keep landscaping lines in check and prevent overgrowth. In these cases, you can prune in the summer, as soon as seasonal growth is finished. As your team trims the trees, there is less leaf surface, meaning that less food is created and sent to the roots. In return, growth is slowed as desired. In most cases, however, you’ll want to schedule the bulk of your tree trimming in the dormant winter season. Oak trees should especially wait until then. If you leave one with its pruning wounds exposed in warm temperatures, beetles could invade the area and cause oak wilt. This fungal disease progresses from leaf discoloration to defoliation and can eventually lead to the death of the tree. When you’re ready to trim your trees, you might be tempted to go out there with a saw and take care of the issue yourself. However, it is in your best interest to call a professional, and here’s why: Trimming a tree isn’t like giving it a haircut. If you get a bad cut at a salon, it’s just hair and will grow back over time. Yet, if someone with little experience and incorrect tools starts hacking away at your trees, they could be deprived of the nutrients they need to live. Even if a tree is growing too tall, simply slicing off its top isn’t the recommended method. Cutting off a large portion of the tree’s crown is known as topping it. Not only does this result in an oddly-shaped tree, but it also weakens the trunk and its support structure so much that the tree eventually dies. As discussed, there is a specific time to trim back your trees. Depending on the species of the tree, its current condition and the look you’re going for, you could damage the tree or wreck your vision by trimming in the wrong season. Trim wounds should be strategically made to minimize the stress on the tree. There is also a correct way to remove branches and reduce height without inflicting harm. Cutting too close to the branch or tearing off the bark, for instance, can deprive the tree of the life-giving nutrients and cells it needs to heal itself. Open wounds made in incorrect places make the tree more vulnerable to disease and infestation. It can be difficult to discern where to stop once you start chopping on a tree. This is especially true if you prune in the summer and can’t see around the thick leaf cover. That’s why it’s important to hire a professional to do the work for you. Someone unqualified might remove too many branches or leaves, rendering the tree too weak to survive. Now that you know why it’s always best to call in a team of professionals when you need tree cutting services, how do you know where to start? After all, it seems as though everyone has an opinion on who to call and who to avoid. Here are a few steps to take to ensure you’re doing your due diligence and getting the best team for your needs. Start by asking your trusted friends, family members and colleagues who they’ve used in the past for similar services. Yet, do more than simply ask if the trees look good. Also question their rapport, professionalism and flexibility. Were they easy to work with? Did they respond to inquiries in a professional manner? Were they willing to walk the homeowner or business owner through the process before making the first cut? Were they polite? Ultimately, you want a tree trimming team that will work with you from the very first day. These experts should be willing to field all your questions and explain every step thoroughly before you even agree to work together. Then, you can take your search a step further by checking for online reviews of local companies. Run an online search for local tree trimming services in your area, and check out the web pages of those on the first page of results. Look for a customer testimonial or recommendation page and peruse the feedback. You can search virtual business review sites to see if there are any companies that stand out from the others. While the team you select will be experts in their field, it’s still important to understand that tree trimming can be a dangerous industry. In fact, in 2017 alone, there were 72 fatal tree work-related incidents. There were also 45 that resulted in serious injury and 11 that resulted in minor injury. To protect themselves and you, a professional tree trimming service provider will have both worker’s compensation insurance and licensing documentation in place. The business license will verify that the company is legitimate, while the insurance will ensure employee coverage in the event that an accident occurs on your property. You should also make sure the team you pick is covered by liability insurance. This will cover your property in the event that it’s damaged while they’re working on-site. Never approve a tree trimming team to get started on work until you’ve seen a free, written estimate first. This means even a solid verbal quote will not suffice. Be wary of companies that charge for an estimate. Though the final number will depend on how many trees you need trimmed, as well as the condition and size of the trees, there is industry data around what you should expect to pay. The average cost for tree trimming is around $200, with prices at $75 on the low end and up to $1,000 or more on the high end, depending on what you need to be done. In terms of size, a smaller tree under 30 feet will usually cost between $75 and $400 to trim. Mid-sized trees with a height of between 30 and 60 feet, such as crabapples, will have a tree trimming cost of between $150 and $875. Finally, larger trees that are 60 feet and taller will require an investment of around $200 to $1,000. You’ll also pay more if the trees you need trimmed are located around a power line. In these cases, the removed branches must be carefully roped down rather than being thrown onto the grass below. This takes more time and effort and thus, costs are higher. When describing the project to a prospective hire, be sure to include as many details as possible, including the exact number of trees to be cut. That way, you can ensure that the quote you receive is accurate. No one wants to be quoted a price for one tree removal when you really need three removed! While you don’t necessarily have to go with the local tree trimming business that has been around the longest, you want the team you choose to have past experience under their belt before you allow them to handle your trees. Ask for pictures of past projects or view their online photo galleries of prior jobs. Inquire on how long they’ve been in business, and what kinds of obstacles they’ve overcome. Do they have any species of trees that they specialize in? This is also a great time to gauge how comfortable you feel talking with the team in question. If they’re hesitant to talk about past work or unable to answer any of your questions in general, their experience might be lacking. While everyone has to start somewhere, it’s preferable that anyone with the potential to drastically change your landscape is qualified and trained to do so, with plenty of hands-on work to share. Do you live in or around Venice, Florida? If so, you know that our area boasts some of the most impressive scenery around, highlighted by towering palm, pine and oak trees that cut into the skyline. Yet, you also know that these trees can grow out of control if not trimmed back. We’re a full-service team of tree experts specializing in these species and others. 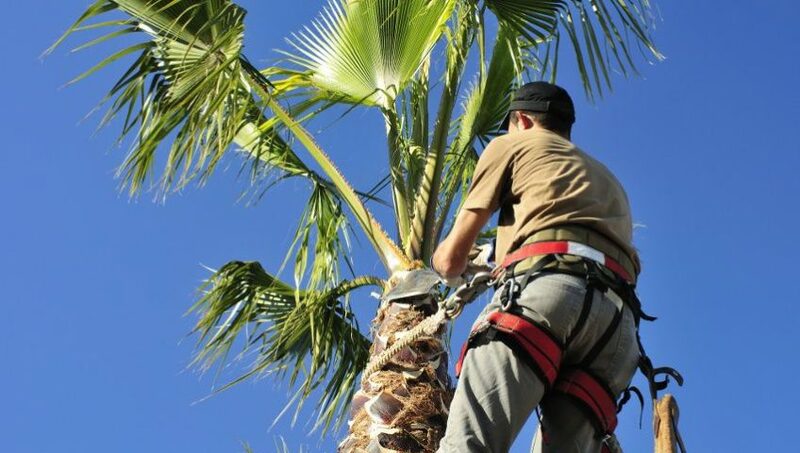 From a single palm tree removal to a neighborhood-wide tree trimming services, we can do it all. With 15 years of local experience, we understand the area’s terrain and are used to working on a variety of land and aquatic projects. Contact us today to learn more and receive a free estimate!